The Seasoned Spoon is pleased to announce that we will be running another series of Come Cook With Us classes this Winter on Mondays from 4:30pm – 6:30pm. This exciting new series will feature a different cultural cuisine each week. The first week will feature Thai Food! Learn all about Thai spicing and how to start incorporating Thai flavours into your home cooking. Make a variety of traditional Thai dishes together which can be easily adapted to vegan and/or gluten free versions! We are proposing that SAFSS become a TCSA Levy Group at Trent University starting from the 2015/2016 academic year. In order to move forward with this we must form a Levy Question. Which of the following do you feel would evoke the most positive response from the student population. 2. 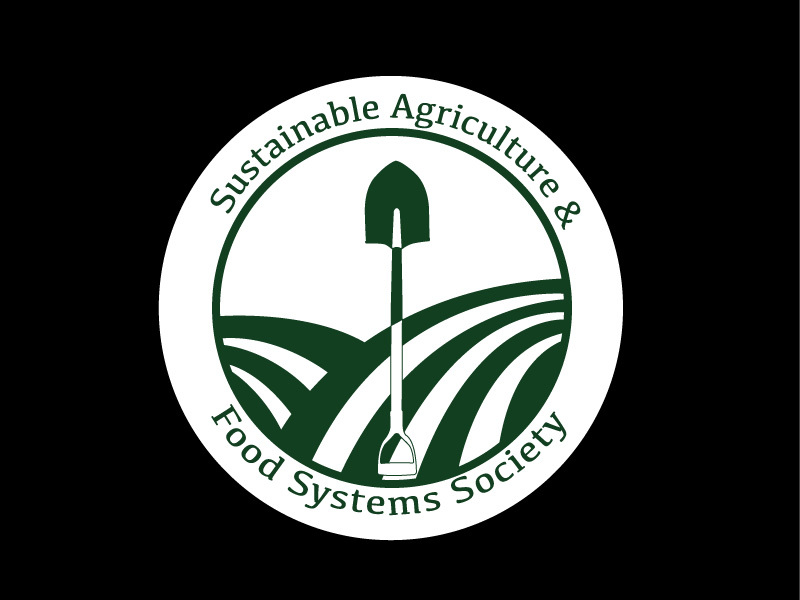 Do you support the creation of a 2.00$ refundable levy so that the Sustainable Agriculture&Food Systems Society can work to make the Trent Food System more self-sufficient. 3. 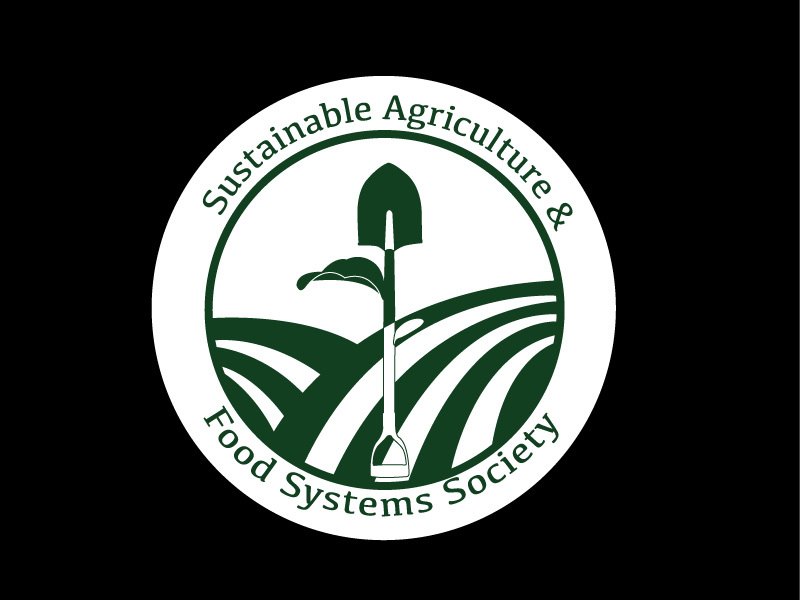 Do you support the creation of a 2.00$ refundable levy so that the Sustainable Agriculture&Food Systems Society can support the increase in sustainability of Food Services on Campus. Please indicate your preference in the poll﻿ below. Other suggestions will be considered until February 3rd. Signature collection begins February 9th. If you identify as SAFSS Member and would like to see this succeed, please email us your availability for the time period of February 9th-27th, and consider helping to collect student signatures. 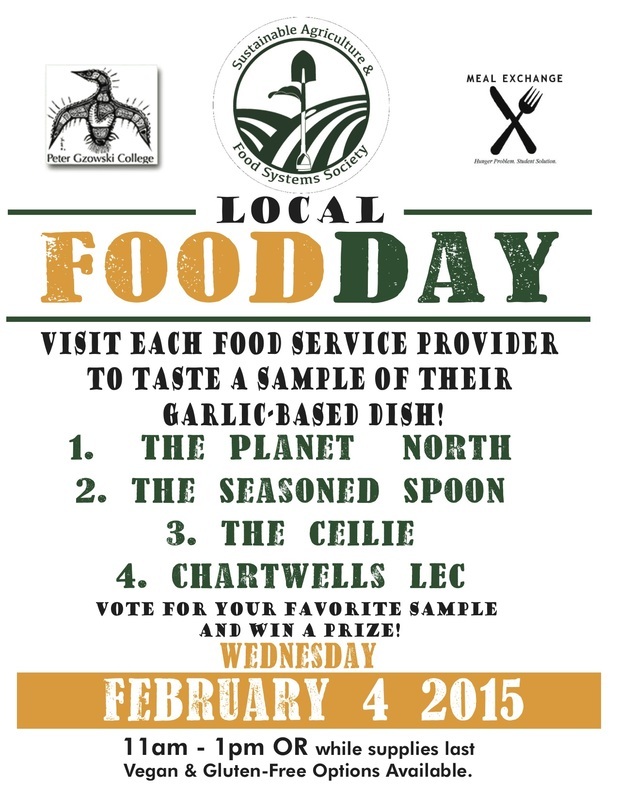 Local Food Day is happening next wednesday, Feb 4th from 11-1 at all the Food Service Providers on Campus. Check them out, tell us your favourite and win prizes! Based on the Doodle Poll sent out recently, we have chosen a regular meeting schedule for this semester. Thank you to everyone who participated! Fri Mar 20 Party!? Time and Date TBA! Ever wonder what it is about chocolate that makes you get out of bed in the morning? Or why cacao is one of the most traded commodities in the world? Join local chocolate alchemist Dan Legaut as he explores the craft of chocolate creation, the culture of cacoa and the integrity behind this amazing superfood as a medicine and sensual pleaser As part of self- love week, we may even be adding some extra aphrodisiac ingredients into these chocolates! 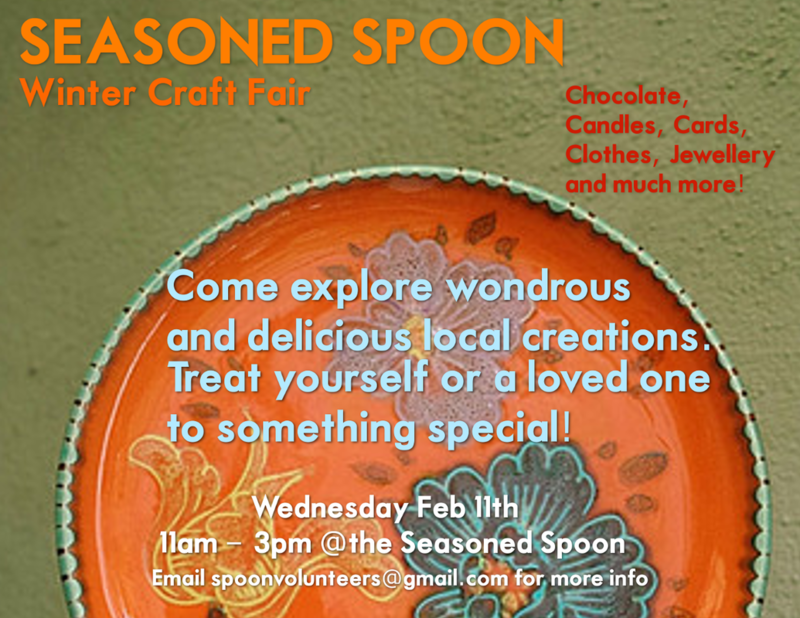 Bring yourself or a date and get silly on Cacao!!!!! Who doesn't love cookies? I know you do! Well now you have the opportunity to engage in exchange with other cookie lovers!! Bake cookies for others and get to try their cookies in return. Leave with an abundant variety of cookies to eat, share or give away to friends for self love week! email sarahgervais@trentu.ca to sign up! Immediately following our cookies exchange we will have a self- love talk and discussion. Learn about all the best ways to love yourself as you are and honour yourself care for yourself emotionally, mentally and physically! This talk is FREE and anyone can participate - whether you are doing the cookie exchange or not! ReFRAME is starting this weekend, and there is a a number of great food movies being featured! of Toronto’s Environmental Task Force. 2) Topics relating to food waste, urban poverty / inequality, and food security. Beating out Design E by only a few votes, design B has been chosen by majority vote! Thank you to EVERYONE for giving us your opinion and participating in our Logo Competition! The Sustainable Agriculture and Food Systems program was started in 2011, featuring both arts and science streams. 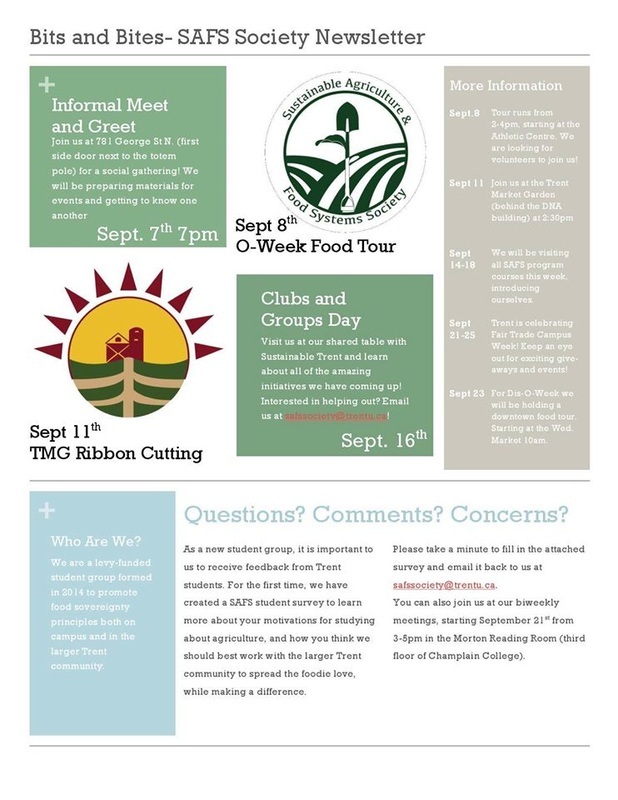 This program provides tools to effect change, and challenges students to create food systems that are equitable, ecologically sensitive, and productive. The SAFS Society aims to increase student engagement while fostering a community of students interested in deepening their understanding of sustainable food systems. We hope to partner with a variety of stakeholders on campus, and invite all students (regardless of program) to join us as members or volunteers. Join us from 5:45-8pm at The Only after the ReFrame showing of “Fed Up” (4pm, for 92 mins at Showplace). Discuss the film with other foodies, socialize and enjoy a favorite local venue! All ages welcome! Mark Wednesday February 4th and Wednesday March 18th on your calendars! Visit all of the Symons campus food service providers for free samples of local product based dishes from 11am-1pm. Vote for your favorite dish to determine the winner of The Golden Beet award, and for a chance to win one of our great prizes courtesy of ChocoSol, The Main Ingredient, Two Dishes Cookshop, Chartwells and more local organizations and establishments! Thank you to our partners at Gzowski College, Meal Exchange and the ERS department. Interested in celebrating the UN designated “Year of Soils”? Want to learn more about pollinators, and share that info with the larger student body population? Get involved in the planning of this exciting event! Other projects that SAFSS are partnering with include the Trent Experimental Farm and Chartwells Key Focus Initiative Gardens. We have 5 Logo submissions and we would like your feedback and opinion! Responsibilities of this position include developing content for the SAFS website (www.trentu.ca/agriculture). It will include developing ideas regarding useful and interesting content, obtaining information from SAFS faculty and other sources, and composing web-ready text and visual material. 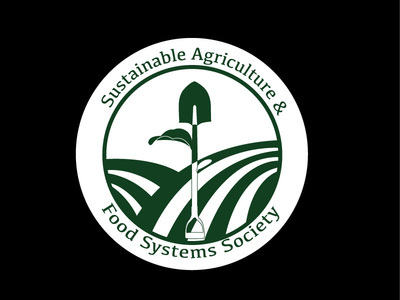 Qualifications: This position is open to any Trent student with an interest in sustainable agriculture, and a demonstrated ability to gather information and communicate clearly and effectively. This is a part-time, flexible position; the work can be done at any time during the Winter 2015 term, but must be completed by April 3 2015. Rate of pay: $11.95/hour. Number of hours: 50. Interested students are invited to contact: Stephen Bocking (sbocking@trentu.ca), Chair, Environmental and Resource Science/Studies Program. What: Chartwells has chosen Trent to be a part of it's cross-Canada Key Focus Initiative Project. It has been decided that the KFI at Trent was to be the "Experimental Farm" and sourcing to Food Services at Trent. This means that we are trying to get a working, economically, environmentally and socially sustainable produce growing farm going for this coming growing season. This meeting will be to brainstorm and plan next actions for this project. Bring a lunch! Discussion: PCGN: Where do we grow from here? All Welcome! Free! Snacks Provided! You’ve heard a lot about Temporary Foreign Workers, now come hear from them! Join 3 migrant workers – a Live-In Caregiver, a Farmworker, and a Restaurant worker – to learn about their struggles, their rights, and the laws that impact them. Join our fight to build strong, healthy communities for all of us. Do you have concerns about the impact of GE and GMO foods? Come hear a scientific perspective on the risks to your health. Join Dr. Thierry Vrain, a retired genetic engineer who after a 30-year career with Agriculture Canada now speaks against GE technology, and Mr. Tony Mitra, an internationally active citizen journalist and food security activist, to discuss your concerns about GE foods, and how you can take action. This is a FREE, BY DONATION or Pay-What-You-Can event! 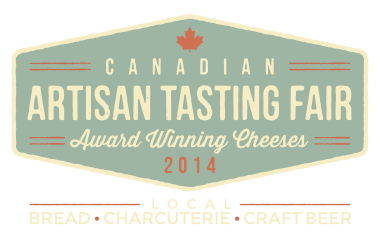 A collection of Artisan food producers for your sampling, tasting, and purchasing pleasure! 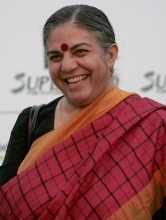 Sacred Seeds, a talk with internationally renowned author and 'seed' activist, Dr. Vandana Shiva at11am, Wenjack Theatre, Otonabee College at Trent University. Tickets are limited and in advance only. Request your tickets on-line here. Donations accepted at the door (suggested $20 or pay what you can). Dr Shiva's book, Sacred Seeds, will be on sale before and following the talk. We do not anticipate time for book signing. We also invite you to join us afterwards at the Gathering Space in Gzowski College for refreshments and a post-talk gathering to discuss Vandana's work in our local context! Dr. Shiva is a recipient of the Right Livelihood Award and holds a PhD in Quantum Theory from the University of Western Ontario. In 1991, she founded ʻNavdanya,ʼ a movement to protect the diversity and integrity of living resources, especially seeds, and to oppose the aims of the World Trade Organization agreement, which would have all seeds susceptible to genetic modification patents and becoming intellectual property. The Society for the Anthropology of Food and Nutrition is pleased to announce an endowed award that honors the seminal work Dr. Marchione did on behalf of the poor and undernourished in academics and through his work as a Peace Corps volunteer, at The Caribbean Food and Nutrition Institute, The Great Lakes Project on the Economic Crisis and USAID. Made possible through generous donations of family and friends, this annual award will be given to a student whose work continues and expands Dr. Marchione’s efforts toward food justice, food security and access, and most directly, food as a human right. 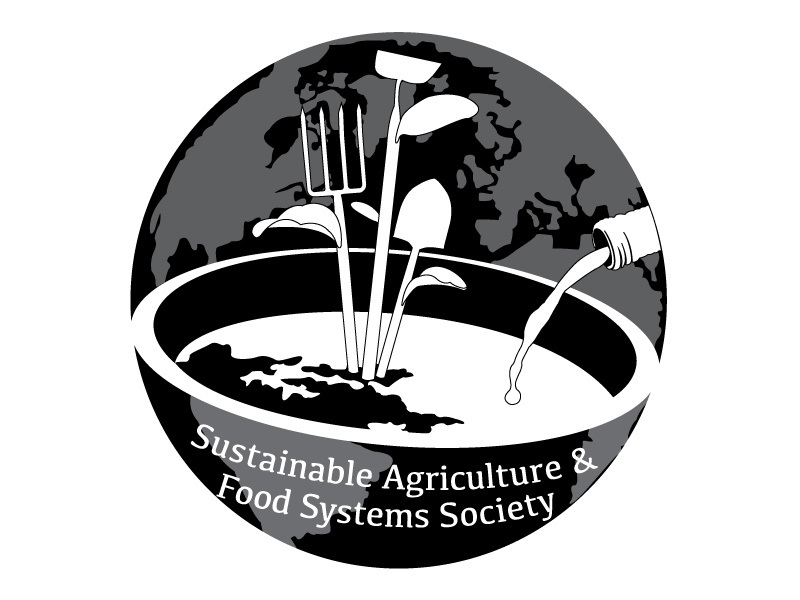 Students applying for this award should demonstrate active and productive engagement with food security and food sovereignty issues. 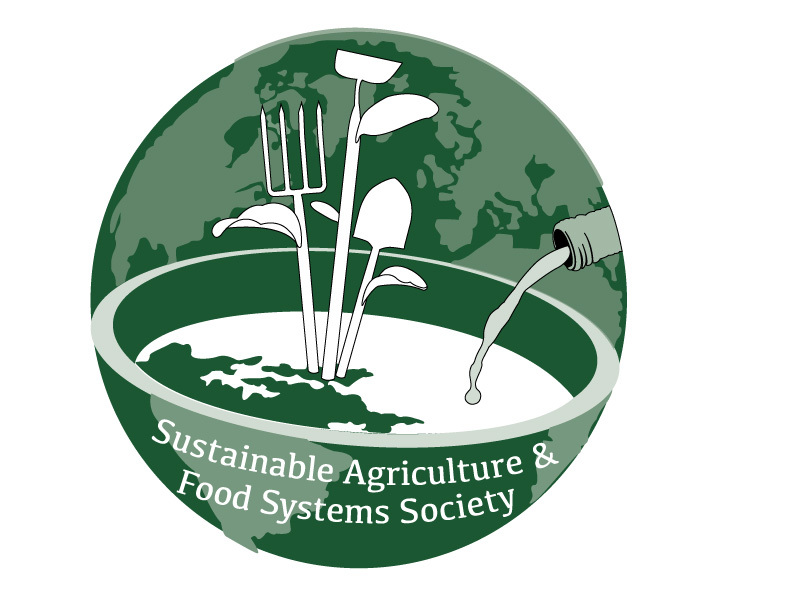 The award can be in recognition of exemplary work already accomplished, in progress, or for proposed research in the field of food as a human right and the social justice aspects of food systems. It should show concern for the poor and undernourished and a willingness to take an active role in working on behalf of food sovereignty. Ideally, it would be given to those who are trying to work, in Dr. Marchione's words, on “the best and more sustainable approaches to fulfill the right to food.” Given Dr. Marchione’s legacy, preference will be given to proposals from students actively engaged in the central issues that animated his career as a scholar-activist. There will be one annual award of $600. The award may be for proposed or in-process research or a research prize for completed work. The deadline for applications is October 31st, 2014. The award will be presented to the awardee at the SAFN annual business meeting at the AAA annual meeting. 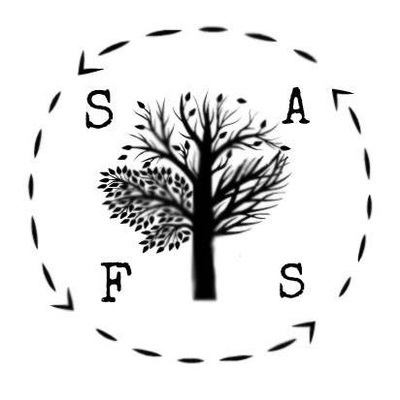 The Society for the Anthropology of Food and Nutrition (SAFN) is pleased to invite students to submit papers in competition for the 2014 Christine Wilson Awards presented to outstanding undergraduate and graduate student research papers that examine topics within the perspectives in nutrition, food studies and anthropology. Papers may report on research undertaken in whole or in part by the author. Co –authored work is acceptable, provided that submitting student is first author. Papers must have as their primary focus an anthropological approach to the study of food and/or nutrition and must present original, empirical research; literature reviews are not eligible. Papers that propose a new conceptual framework or outline novel research designs or methodological approaches are especially welcome. Winners will be recognized and presented with an award at the 2014 AAA meeting in Washington, DC and receive a year’s membership in SAFN. Students (undergraduate or graduate) must be currently enrolled or enrolled during in the past academic year (Fall 2013 to present). The text of papers should be no longer than 25 pages, double-spaced and follow AAA style guidelines. For application details please click on the link above or go here. "On Saturday November 1, 2014, Farms at Work will present this full-day workshop designed for farmers, landowners and concerned citizens. Pollination biologist, Susan Chan will outline the fundamentals of pollination, as well as habitat requirements for pollinators and beneficial insects. Case studies will be presented, and strategies for mitigating threats to pollinators will be proposed. There will also be ample time to visit the Pollination Exhibition, where participants can interact with stewardship organizations and regional businesses that provide pollinator-friendly plant material and services to landowners. If you operate a native plant nursery or are part of a stewardship organization and would like to become an exhibitor, please let us know!"